Why not open up my first game review with a game many consider one of the best of all time. While a review of this may seem old hat (yes, I used that… also, Oddjob is a total cheat in multiplayer), I feel that this game can’t get enough of the occasional boost. I played this when it came out, and spent more than what was probably a healthy amount of time shooting Russians in underground bunkers and flooded caverns… and that was only with the single player. The multiplayer was a different experience entirely. James Bond is one of the more well-known movie characters even created. 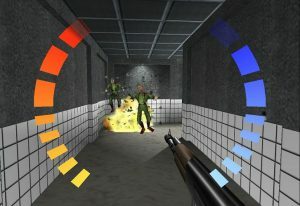 Created by Ian Fleming in 1953, James Bond has been in numerous books and has been the main character in the longest running and one of the higher grossing film franchises to date, but this was the first James Bond game to capture the realistic (for the time) actions of guards with line-of-sight, the ability to patrol and search when alerted. I loved just about everything about this game when it came out, starting at the opening scene of the dam, to the Trevelyan chase in the cemetery. 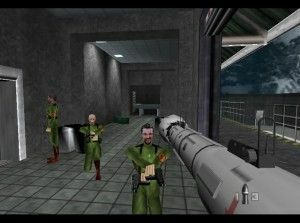 The guns felt fantastic and with the addition of the rumble pak (which was optional in my day, darn kids!) it seemed quite realistic. It was interesting that guards could get limb damage and you could even shoot guns out of their hands (again, revolutionary back then.) The nice change as well was the ability to try and sneak in and take guards out quietly or just walk in like a tank and try and kill them before they kill you. There also was the challenges that accompanied each level, each one really pushed your ability and if completed gave the player a nice cheat… from invincibility to Donkey Kong mode (big head) to paint ball mode, which turned each bullet into a paint ball but still as deadly. While the single-player was fantastic the on-the-couch, multiplayer was what really made the game. Up to four people could play together on a split screen with the option to set up the types of weapons and length (among other ones). It was great to sit there and just blast each other to pieces while eating pizza and being loud and obnoxious (this is something I really miss in most modern games). There’s just something about sitting together on the couch and looking at each others screens to cheat, which just feels incredibly more enjoyable than anything over Xbox Live or PSN. As much as I love this game, the graphics… oh, the graphics. Getting this to work on my television was a chore, but seeing the game again after all these years really hurt some of my optics. It is a testament to nostalgia as well as how far games have come in 15 years. Hands are basically boxes and there aren’t really too many textures to speak of… but hey, no Turok fog! It is nice to barely see any loading screens, but that comes from not only the lower resolutions, but running on a cart. This game also rarely shows many instances of slow down except when there are tons of explosions going… although if you play it right in multiplayer you will definitely have tons of explosions. Coming back to this game after many a year is quite fun, but I have to admit that my nostalgia played a bit of a role in my memories of it. It is interesting to look back at what games were and it is easy to see the amount of fun to be had. See the movie first if you can, it’ll help fill in some of holes. Gameplay: Even given the amount of time since this came out it’s still an incredible experience and still shows that the N64 was a great system. I’d have to rate the gameplay a 9 with how well it stands the test of time, especially in multiplayer. Graphics: While the gameplay is still incredible, playing this on an HD television kind of makes your eyes bleed. If you have a regular SD television laying around, hook up the ol’ N64, grab a few friends and enjoy seeing an entire weekend disappear. As far as a rating goes: on an HD television it would be a 4, on an SD television it would be a 6. Story: Probably a 7 given that this game follows the movie to a decent degree, but the variations aren’t too out of place. If you enjoyed the movie you will like this, even if you haven’t seen the movie the story is still quite good. I burned plenty of brain cells playing this with the guys in my dorm at college. It was a nightly event including the occasional tournament! Love the feature! 2nd to this version is the Gamecube version…nothing beat grappling hook battles! I used to play this game with Scott all the time back in the day. Proximity mines, anyone? This game was sooooooooooo much fun, and I can still remember Scott showing me how to shoot guns out of the guys hands, and watching them dance around after they got shot. Problem: “Goldeneye” can’t be in a discussion of Best Game of All Time in a universe where “Ocarina of Time” exists. But “Goldeneye” was hella sweet. Probably my favorite FPS of all time, and definitely the only one I every played the single player all the way through on. Have I mentioned I’ve never owned an X-Box system? Don’t worry Tom, besides Fallout and Prey you aren’t really missing out.